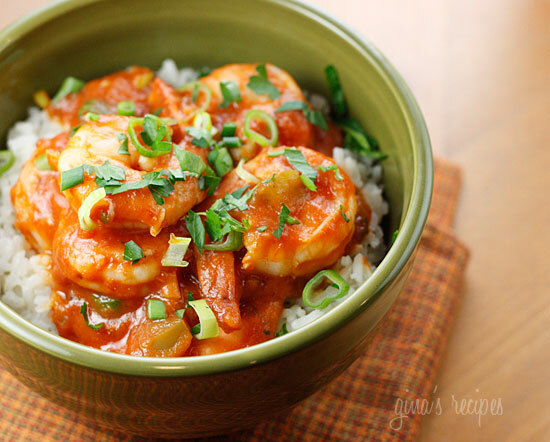 This southern Louisiana shrimp creole dish is cooked with tomatoes, onions, peppers and celery. Adjust the spice to your preference, but don’t be scared of a little heat! With Fat Tuesday right around the corner, I was craving some Creole food and I knew exactly who to go to, my friend Mary from Deep South Dish. 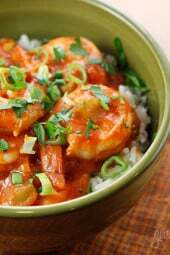 Her blog features authentic coastal southern recipes. I adapted this to make it lighter and used ingredients I had on hand. Turned out delicious and it was quick and easy to make. Serve this over white rice, brown rice or would even be great over quinoa. Add the chopped onion, green bell pepper, garlic and celery and saute until tender. Add tomatoes and tomato sauce, cayenne pepper, cajun spice, bay leaf and bring to a boil. Cover and reduce heat to low and simmer 20-30 minutes. Make a slurry of the flour and water and stir into the tomato mixture. Continue cooking for another 5 minutes. Lightly season the shrimp with the Cajun seasoning and add immediately to the tomato mixture. Add Worcestershire sauce and hot sauce; stir together. Cook for another 5 to 6 minutes, or until shrimp is opaque and cooked through, adjust salt if needed. Add chopped green onion and parsley and serve.